Ohashi caps her last performance at home with a 10 on floor exercise, following Ross’ perfect score. 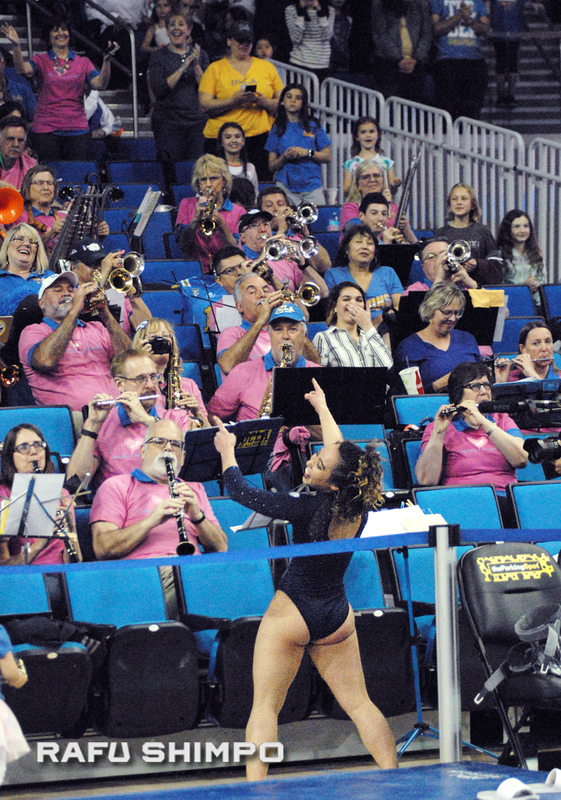 WESTWOOD.–By the time Katelyn Ohashi was leading the UCLA Alumni Band in “Sons of Westwood,” the party everyone had been expecting was in full swing. Ohashi, in her final competition before a home crowd at a sold-out Pauley Pavilion, was taking a victory lap after scoring a perfect 10 in her floor exercise. She sprinted past hollering students, collecting high-fives, only to halt briefly in front of the band, wildly conducting the group in UCLA’s iconic fight song. The day was more sweet than bitter, despite the looming departures of Ohashi and three other seniors, as well as their beloved gymnastics head coach, Valorie Kondos Field. The meet that ended with Ohashi taking her turn with the maestro’s baton was never really close, as No. 2 Bruins defeated Utah State, 197.575-194.850, in front of 12,270 fans at Pauley. 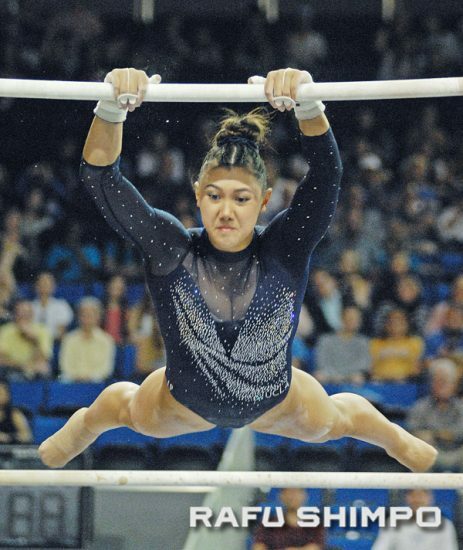 Kyla Ross completed the “Gym Slam” with her career-first perfect 10 on floor exercise, while Ohashi provided the grand finale to her Pauley career with a perfect score of her own on floor. Ross set a new school record with a 10 in her seventh straight competition. The junior now has nine this season and 14 for her career. Ohashi has earned five this year and 10 over the course of her time in Westwood. The 49.825 team score on floor is a season-high for UCLA (12-1). It represents the third-highest score in program history. Fittingly, the performance took place on Valorie Kondos Field Floor. 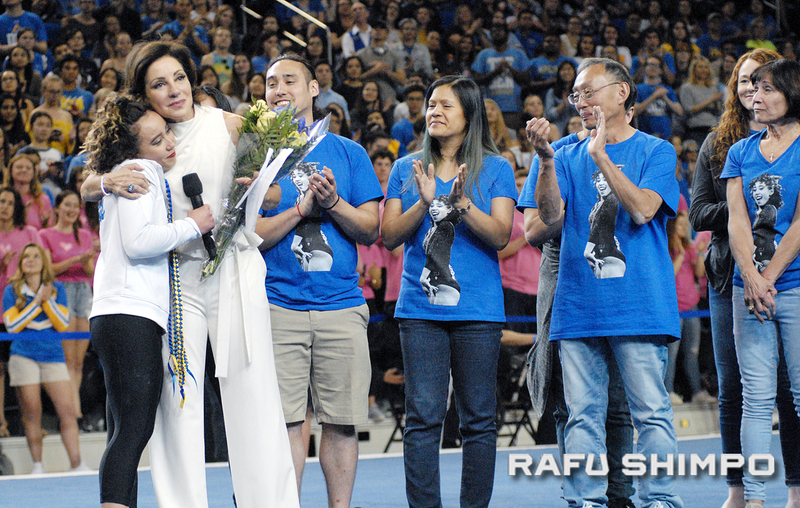 In a pre-meet ceremony, UCLA Director of Athletics Dan Guerrero paid tribute to the legendary coach and the countless memorable floor exercise routines under her tutelage by unveiling the honor. Kondos Field will retire at the conclusion of the season, her 29th as head coach. UCLA’s Felicia Hano starred on vault in the first rotation, matching her career-best score of 9.95. Nia Dennis also stuck her landing for a mark of 9.85, while Pauline Tratz checked in at 9.825. Sekai Wright and Gracie Kramer posted scores of 9.775 and 9.7, respectively. Four Bruins notched scores of 9.9 or higher on uneven bars in the second rotation, with Dennis continuing her stellar day by way of a career-best 9.95. Madison Kocian added a 9.95 of her own. Norah Flatley posted a 9.925 and Margzetta Frazier led off at 9.9 to round out the 9.9 club. Ross scored 9.475 as UCLA extended its overall lead to 1.2. Ross fell just short of perfection on beam, closing out the third rotation at 9.975. Grace Glenn bookended an impressive team performance for UCLA, leading off with a career-high-tying 9.95. Flatley and Brielle Nguyen registered 9.85s, while Kocian and Ohashi added 9.825 scores. The Bruins saved the best for last, with the 10s from Ross and Ohashi capping a memorable day. Tratz also shined on floor with a career-high 9.95 to match Hano’s career-high-tying leadoff performance. Kramer added a 9.925 for good measure. Ohashi said the supercharged environment around the gymnastics team that has become the talk of college sports is something she will never forget. UCLA honored the career and lasting impact of “Miss Val” throughout the afternoon, with a plethora of gymnastics alumni in attendance. Over her 29 years at the helm, she has guided her teams to a record of 528-121-3 and all seven of its NCAA Championships. The four-time National Coach of the Year and Pac-12 Gymnastics Coach of the Century has also seen her teams rack up 14 conference and 19 NCAA Regional titles. Taking the mic during the Senior Night ceremonies, Ohashi credited Kondos Field for raising the level of college gynastics as a whole, and for helping her rediscover the joy in the sport. “If it weren’t for her, I wouldn’t be the person I am today. If it weren’t for her, I don’t even know that I’d be a gymnast today. So, for that reason, she has probably changed everyone’s world that’s in here today, and I want to thank her for that,” Ohashi said. Senior support staff members and student-athletes Nguyen, Ohashi and Macy Toronjo were also recognized for their accomplishments, which have included one NCAA Championship, two NCAA Regional titles and two Pac-12 titles. With the regular-season portion of its schedule complete, UCLA heads to West Valley City, Utah, Saturday, in hopes of defending its Pac-12 Championships title. The Bruins will compete in the evening session beginning at 5 p.m. Pacific Time. Pac-12 Networks will provide live television coverage of both sessions. Meanwhile, Ohashi has been selected as one of six finalists for the AAI Award, which is presented to the most outstanding senior female gymnast in the country. Ohashi joins Alicia Boren (Florida), Brenna Dowell (Oklahoma), Sarah Finnegan (LSU), Olivia Karas (Michigan), and Toni-Ann Williams (California) as finalists for the prestigious award, which will be announced at the NCAA Championship banquet in April. In its history, UCLA has had four winners – Vanessa Zamarripa in 2013, Jamie Dantzscher in 2004, Mohini Bhardwaj in 2001 and Donna Kemp in 1984. Ohashi has raised the profile of NCAA Gymnastics to unprecedented levels, with video of her first perfect 10 floor exercise routine this season going viral to the tune of 117 million views. She has gone on to earn four more perfect 10s in 2019, bringing her career total to 10, fourth-most in school history. Ohashi ranks No. 1 in the nation on floor exercise with an NQS of 9.995. She is averaging 9.975 for the year and is unbeaten on floor with 10 victories. On balance beam, she ranks No. 2 in the nation with an NQS of 9.965, and she has a season average of 9.925, with a high of 9.975 achieved four times. Ohashi tied a Pac-12 single-season record this season with five Specialist of the Week awards, giving her a career total of nine, also tying the Pac-12 record. Last season, Ohashi won a share of the NCAA floor exercise title and helped lead the Bruins to an improbable come-from-behind victory at the NCAA Championships. She was also awarded the Pac-12 Specialist of the Year. The six-time All-American is a standout off the floor as well, spearheading a fundraiser for Bruin Shelter, a student-run shelter for homeless students at UCLA, and working with Project Heal, a nonprofit that provides access to healing for all people with eating disorders. She has used her celebrity platform to spread messages of self-worth, inclusiveness, empathy and finding your joy and has participated on panels around campus to talk to fellow students about body image, eating disorders and mental health. Academically, she earned Director’s Honor Roll distinction last quarter and is scheduled to graduate in June with a degree in gender studies.